I have a hard time when it comes to eating breakfast. Nothing really ever sounds tasty or original-except coffee. I mean really, how much oatmeal and scrambled eggs can a girl eat during the week? I also think its really important to get protein and fiber in first thing. It helps to stabilize blood sugar, which in turn, curbs cravings. If sets me up to make good food choices for the rest of the day. In my quest to find a simple answer to my breakfast consumption malaise, I came across a fantastic site called Detoxinista.com, where I became inspired to make one morning, a flour-less zucchini pie. It called for 5 ingredients, 10 minutes of prep, and 30 minutes to cook. It was delicious and super easy! 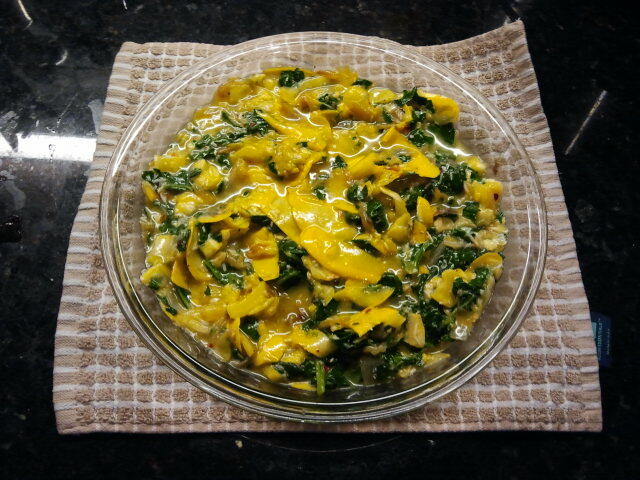 And so, this morning, I thought I would try it again with a little spin and modifications based on the veges I have in my fridge right now…which, being summer, is yellow squash, kale, and shallots. The original recipe called for goat cheese, which i didn’t have. 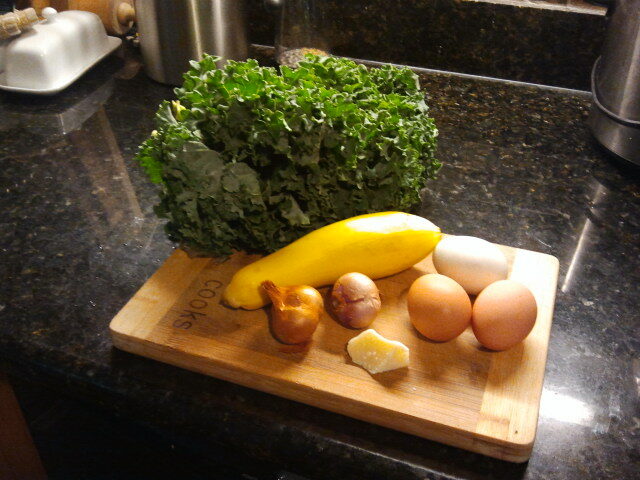 But I do have some nice sheep’s milk Pecorino and I also added one more egg for extra protein. This is the beauty of this recipe. It can be jiggered anyway that you want. Slice two small shallots or 1/4 cup of onion and sauté in olive oil until translucent and very slightly browned. 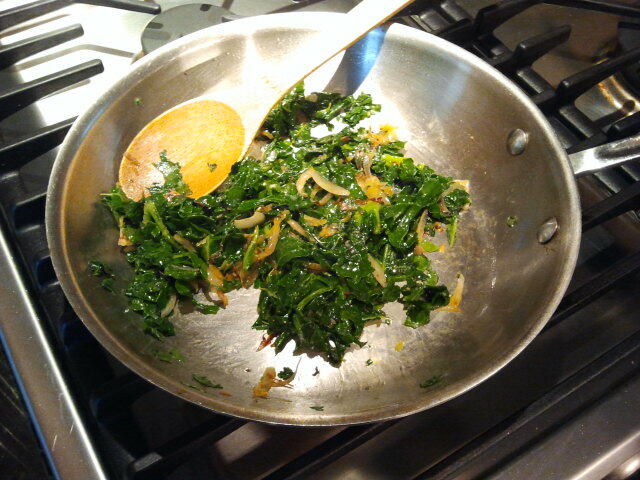 Then add 1 1/2 cups of finely torn kale and continue to sauté for 2 minutes until kale is soft and a beautiful color green. 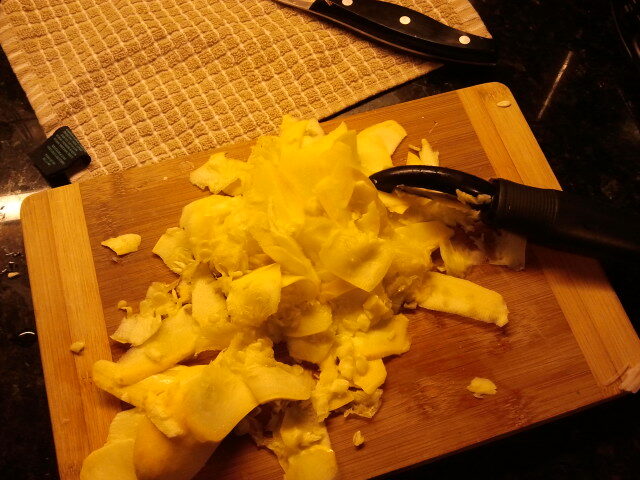 While the shallots are cooking, slice your zucchini or squash with a potato peeler and then ring out the moisture. I literally did this over the sink with my (clean) hands. 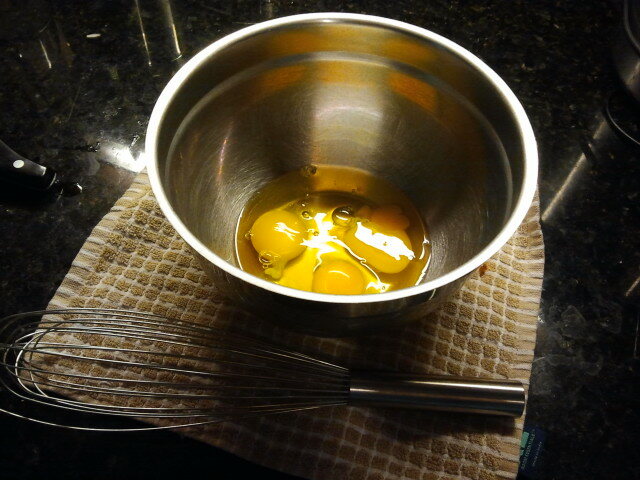 In a medium sized mixing bowl, crack three eggs and whisk. 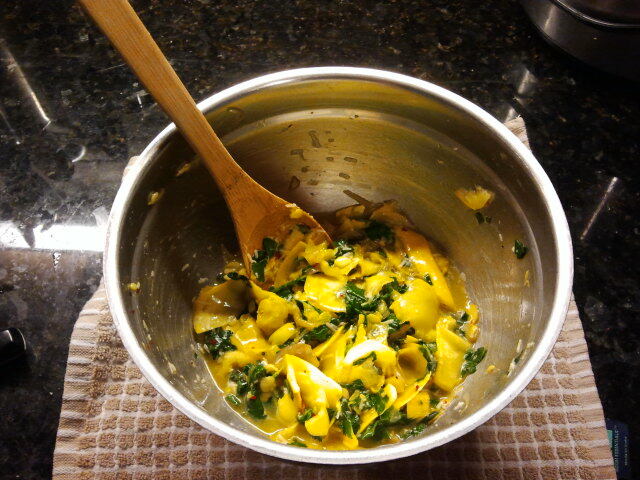 By this time your shallots and kale are done and you can add it and the squash to the eggs. Add in your cheese, salt, and pepper (I used red pepper flakes because its my favorite spice to add to everything.) Mix everything together. Pour mixture into a 9 inch round glass or ceramic pie dish. Bake the pie at 350 degrees for 30 minutes–during which time you can shower and get ready for your day. Once your are primped, breakfast will be served! 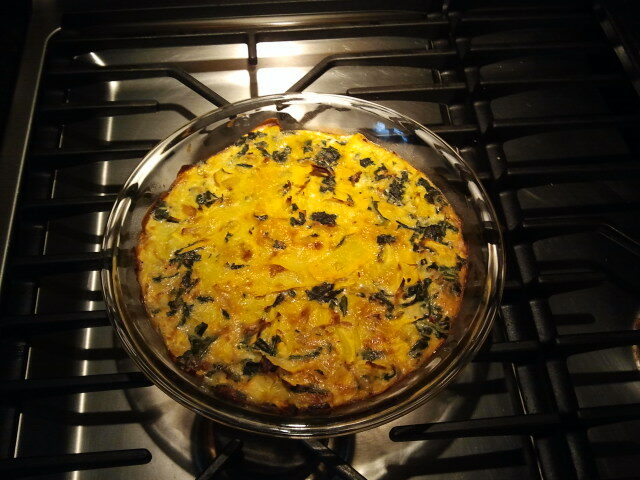 In my attempt at using my time efficiently, I try to cook once and have leftovers for at least three meals thereafter. So if you are not sharing this pie with friends over brunch, be prepared to have breakfast covered for nearly half the week! Bon Appetit!